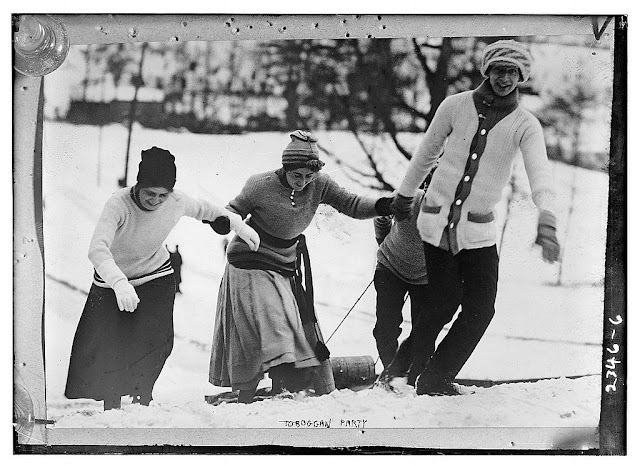 Toboggan Party, glass negative, ca 1910-1915. Source: Library of Congress Prints and Photographs Division Washington, D.C. The social aspect of tobogganing with friends is an enjoyment that can be experienced on snow or in water. Today's post shows images of winter tobogganing, with water tobogganing images to follow at a later date. 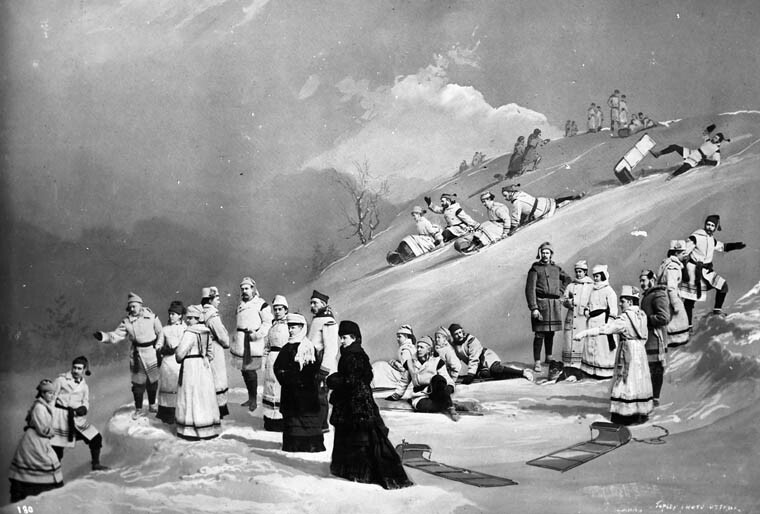 In today's modern world the sport of tobogganing might be considered too childish for adults with hectic lives, but a century ago, it was used as a social event for all ages, and especially as a romantic pursuit at a time when chivalry, chaperones and decorum often stood between two interested parties. 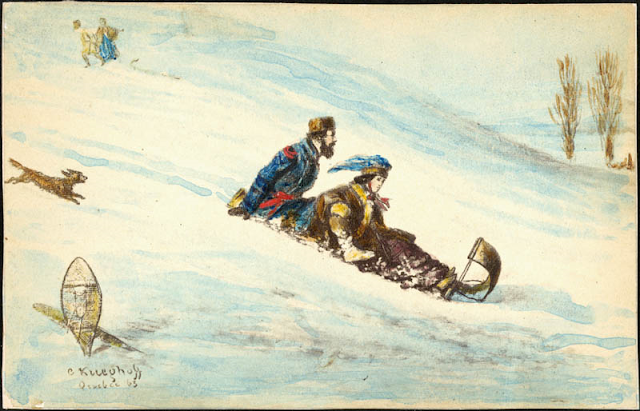 In Sketches from America published in 1870, John White states "...a toboggin is made to hold at least two persons, as in the practice of the sport these two persons are usually of different sexes..." He goes on to explain that the person who steers the toboggan is at the back and can choose the snowbank he wishes to end up in when he upsets the craft and tumbles into the snow with his seat mate of choice. How clever. Around the same period, Outing: The Gentleman's Magazine of Sport, Travel and Outdoor Life, Vol IX Oct 1886-1887 states that, "At present every Canadian city has its toboggan clubs with their elaborately built and prepared slides." The article, Snow-shoe and Toboggan by Newell B. Woodworth, goes on to say that in November 1884, the Saratoga Toboggan Club in New York had the first designated slide in the United States, as opposed to untended natural hills and slopes. By 1886, the Saratoga club slide had been moved to the Glen Mitchell Hotel where it became the longest in the nation running with almost 2,000 feet of iced surface. Boston, Mass. 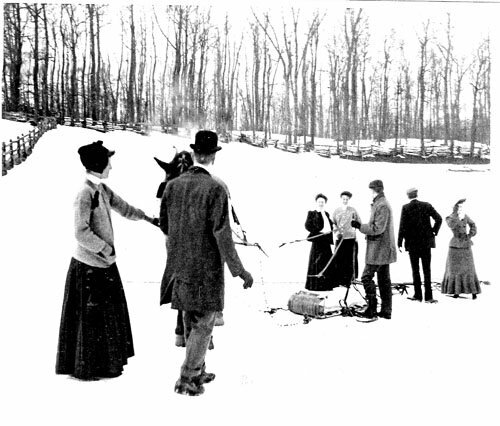 had an informal toboggan run in Franklin Park prior to 1904 when a large slide was created to provide the public with an alternative sport to ice skating. Toboganning [sic] scene at Franklin Park, Boston, Mass. C1904 Panoramic. Source: Library of Congress Prints and Photographs Division Washington, D.C. 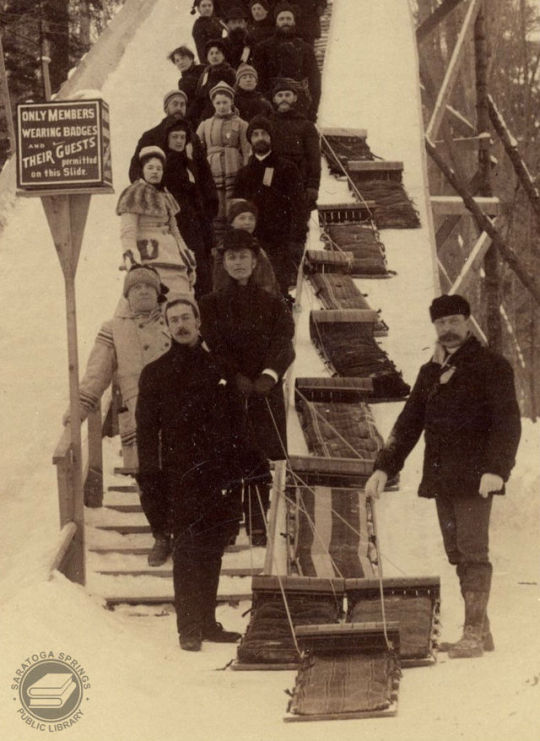 In Burlington, Vermont, the Charles H. Emerson & Co. manufactured wood products including his patented STAR toboggans, promoted as being, "The Best Flat Toboggans Made". 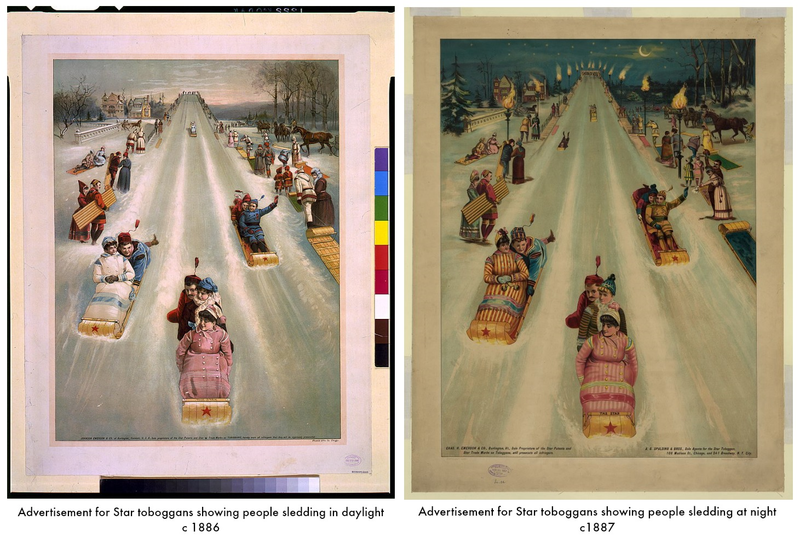 [Advertisement for Star toboggans, showing people sledding in daylight] / Phoenix Litho. Co., Chicago. C1886. 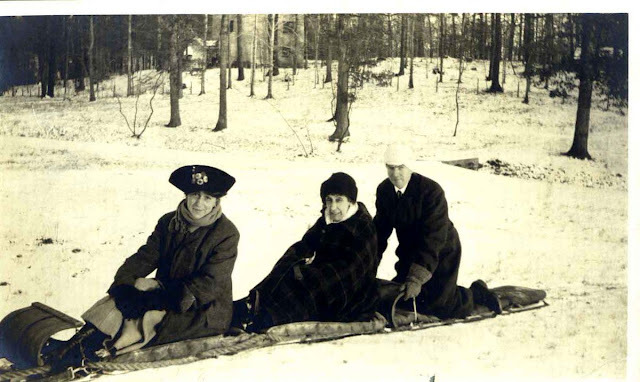 Source: Library of Congress Prints and Photographs Division Washington, D.C.
Near Wilmington, Delaware, the Winterthur Museum is a good place to look for snow images, including these next two showing the social aspects of tobogganing. Since I've shown you enough photos of the bottom of a toboggan slide, what about one from the top? Taken during the 1922 Ottawa Winter Carnival, the toboggan slide ran alongside the drained Rideau Canal locks and down to the Ottawa River. If not a participant, the best vantage point was on the stone terrace of the Chateau Laurier which was also the launch point of the slide. Tobogganing on an iced slide of this magnitude would be exhilarating, don't you think? Oh my!!! Looking at that photo taken from the top of the slide, I'm not sure if I would do that!!! This was fun, thanks for digging up all that information and those gorgeous pictures. I love the vintage photos! I'm not sure "exhilarating" would be my word of choice. Terrifying would be more like it! Seeing and reading about tobagganing had me wanting to go until I saw the iced slide. I'll past on that, but with all the snow predictions sleding sound exciting if I was only younger to enjoy. 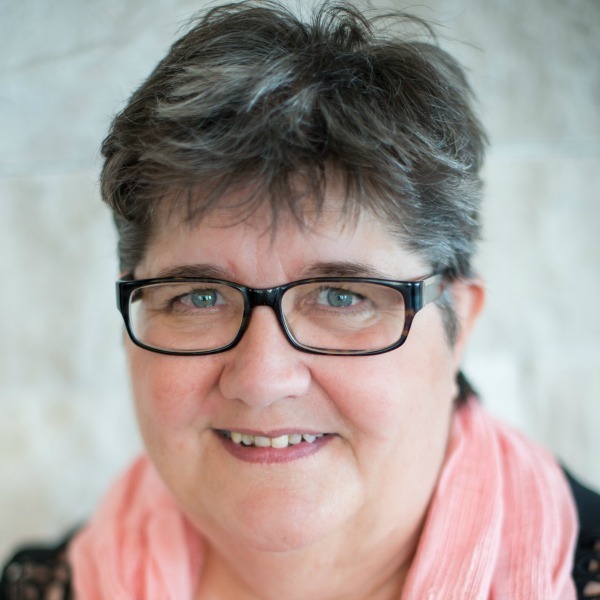 Thank you for sharing the pictures and tidbits about tobogganing and sleding in other posts. You're very welcome, Marilyn. I'm glad you're enjoying the series. It's funny that we average 3 feet of snow and yet when the kids came home for Christmas and wanted to go tobogganing on the nearby hill there wasn't enough snow to cover the short stubble, never mind the flattened weeds on hill. The oldest went back to Vancouver disappointed, but I reminded her that she should have been here about 3 yrs ago when the snow was 6 feet high - in March! No, thank you. 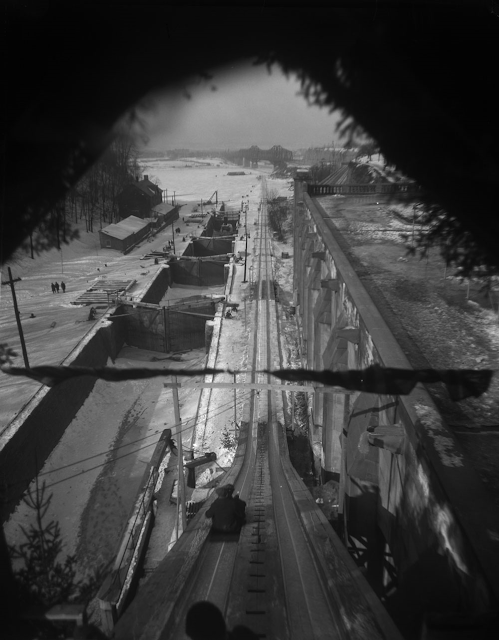 But a ready-made and maintained toboggan run would have been ideal.